Downstairs-Comfortable sitting room with leather sofa & 2 armchairs. TV, DVD & a coal fire. Dining room with seating for 6. Well equipped kitchen with electric cooker, microwave & fridge. Phone for incoming calls only. Now has Wi-Fi. Upstairs-Two bedrooms-double & twin. Bathroom. Separate toilet. Board, Pulley & Chest Freezer. There is also a clothes line in the garden. Lovely well kept enclosed garden with Table & chairs. Parking available for 4 cars. Shed with starter fuel for fire-coal & kindlers. Can also store your bikes here. Can also bring your own boat or canoes. Bed linen provided. Sorry no pets allowed. 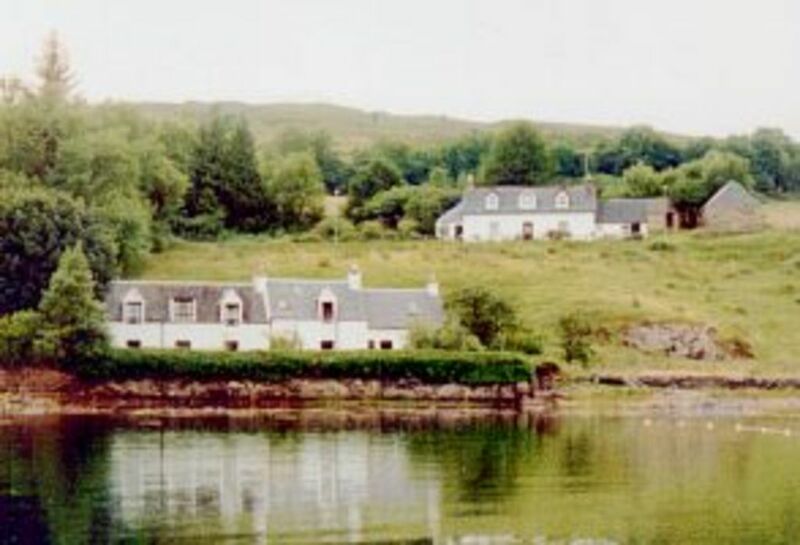 Two beautifully situated seaside cottages to rent on the shores of Lochcarron,Wester Ross,Scottish Highlands.. Both are cosy & well equipped with each sleeping 4. Linen plus total control heating is included in price. Each cottage has a coal fire. Sorry no pets allowed. The cottages are secluded but close to local amenities with shops,cafe,hotels & pubs all within walking distance. Free Wifi in both cottages. The local area provides visitors opportunity for lots of outdoor activities. These include-Fishing, Golf, hill walking, mountain climbing, bird watching, painting, cycling & sailing. Our cottages are ideal for spending a relaxing holiday in Lochcarron or using as a base to explore Northwest Scotland - Skye, Kintail, Eilean Donan Castle, Brochs at Glenelg, Plockton, Shieldaig, Torridon, Applecross, Gairloch & Ullapool. General items: total control electric heating. Garden furniture is also available. A great spot to spend some time exploring, Mairi is very friendly and helpful and the cottage has most things you would need, it's cosy in winter and clean. Stunning location, clean and comfortable. We ( a couple) had a lovely week in Cottage 2. It was exceptionally clean and had everything we needed, including coal and wood for the fire, making it very easy to self cater and cook for ourselves. However if you don't want to cook there are some excellent places to eat and drink in the village, a 20 minute walk away. We highly recommend the bistro and the fish and chips from the cafe. We brought them back to the cottage and sat on the bench just outside the garden wall to eat them overlooking the loch. The location is stunning, right on the shores of the loch. We swam every day from just outside the garden wall. The view is breath taking and can be equally admired when we were feeling lazy or having a "reading morning" from the cosiness of the very comfortable double bed. We were also able to go for cycle rides, runs and walks without getting in the car. When we did get in the car to go further afield we were not disappointed either. We took the scary/exciting road with amazing views, over to Applecross - here we would recommend a visit to the Walled Garden for cake or a full meal. We also went over to Skye for a day of cycling and drove round to the other side of the peninsula for a walks and cycle ride. You can buy a book of walks/cycles/kayaks in the very well stocked village shop. The loch is home to dolphins and porpoises which we saw from a beach at the end of the peninsula. Mairi the owner was very friendly and helpful and came straight away when the wifi stopped working. (The router is in Cottage 1 and the guests staying there had accidentally pulled a wire out). Some other reviews have mentioned the lack of shower and "fadedness" of the property. This is a very old traditional Highland cottage with small rooms and the upstairs is built into the eaves. There is therefore no room to fit a shower (height wise) in to the bathroom. However the hose attachment to the bath works well and you can stand in the bath to shower and look out of the velux window at the awesome scenery. It really was NOT a problem. Once again the bathroom, like the rest of the house was exceptionally clean. As for "faded" I would say traditional or quirky as opposed to trendy. The leather sofa and armchairs were very comfortable. There was a very faint damp smell when you first walked in but not something you noticed after a few moments and the cottage was very warm. We will definitely be back and highly recommend. Hi Thanks for your lovely review. You were perfect guests & left the Cottage lovely & clean. Glad you had an enjoyable holiday & look forward to seeing you both again soon. Initial thought was gosh, although the photographs are a true representation, what they can't show is the atmosphere and feeling that you are walking into history. Mairi seems absolutely proud of her heritage with the cottage and rightly so as it maintains original features which are to be enjoyed. On the plus side, the living room furniture and beds are very comfortable and a working real fire is gorgeous. The views are stunning. Down side, as a paying guest I would have hoped for a more workable kitchen. Many issues, in that it isn't really a kitchen, just a space with a (very old) cooker one end and a sink the other with cupboards between. Not sure thar would pass health and safety inspection! But I'm not an expert. I became accustomed to the rather musty smell which I suppose comes with an old property and in the end appreciated the quirkiness. I just wish I had known beforehand. A few tweaks here and there, like a shower, would help. Also be aware, no shaver/electric toothbrush point. No big issue but handy to know. Immaculately clean, and a lovely host in Mairi who came during the week to make sure all was ok. I do hope she takes this as a help for other visitors rather than a criticism personally. The kitchen is Galley style but well equipped and functional.The free standing cooker is well used-not old. There is also a fridge,microwave and larder as well as cupboards and sink. This is a Cottage built in the 1850s with a lot of original features but some modern touches. Please only book if you want a Cottage with character & an authentic Highland experience which is reasonably priced. We have spent a very enjoyable week in cottage 1: the view from the bedrooms and bathroom on the first floor is astonishing (and changes all the time according to the weather). The bedrooms are spacious and the beds very comfortable. The only slight draw-back is that the bathtub is not ideal to have a shower. The owner is very helpful, she put the heating on for us before we arrived, which was a nice surprise as it was quite chilly outside (in July!). The garden is beautiful, and the area very, very quiet! We shall recommend this cottage to our friends. I am so pleased you enjoyed your holiday with us. Thanks for looking after the Cottage & leaving it lovely & clean. Hope to see you all again sometime. Lovely cottage on a perfect location. Beautifully and comfortably furnished, much room and all of the four rooms have a nice place to sit with a view over the lake. We also enjoyed the lovely garden. Many possibilities for walking and cycling in the area and good shops and cafes nearby. Lochcarron is a village in Wester Ross in the Highlands of Scotland .There is a well stocked Spar supermarket, an award winning Butcher & a garage shop.There are 2 Hotels/pubs,a Bistro & Cafe. All within 1-1.5 miles of Cottages. There is a 9 hole golf Course;you can choose between hill loch,river or sea fishing and it's perfect for people who like messing about in boats. Bring your own or canoes etc can be hired at local garage. Lochcarron is an ideal base for walking & climbing.